The secrets of Taxman’s recent work on remastered Sonic titles keeps emerging. 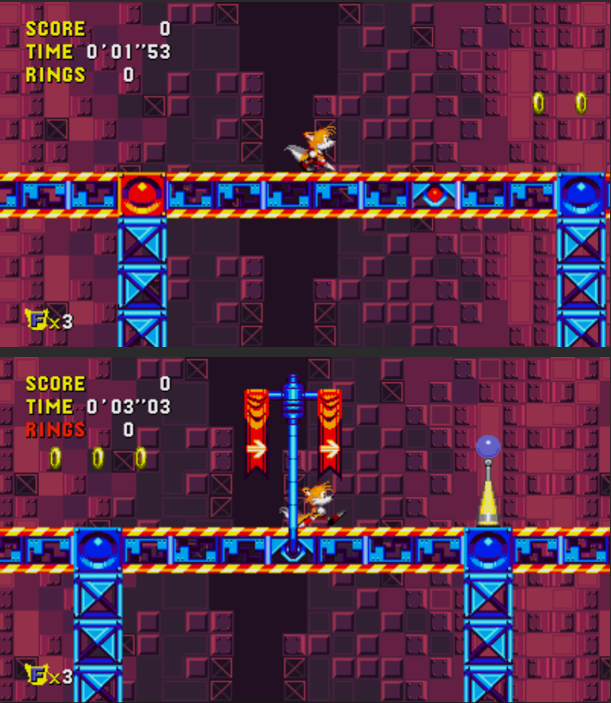 Over the weekend, a major find and revelation was uncovered in Taxman’s Sonic CD port on PC: A near fully realized rendition of Desert Dazzle Zone, one of the original title’s scrapped stages, made its way into a copy of the game. Video proof is provided below. Though the level looks fairly unfinished, it can be completed. A patch has since been made available on PC for those to access Desert Dazzle. Oh man, that was not meant to be in there! What you’re seeing is basically all that was playable (although the wonky palette cycling must be because you’ve hacked it in over Palmtree Panic). The level design isn’t anywhere near done, it’s only a test to see what structures look nice / what ideas are worth pursuing. Same goes with the music – it’s only playing the D.A. Garden track because there’s nothing else to use. Had it been done, Desert Dazzle would have been full length Round with time zones and new music. I’m quite fond of the art I made for it actually, it was somewhat of a happy accident coming up with those patterns and colours. Taxman has not commented on the latter. Thanks to Jorge Canita for tipping us. If you have news to share, be sure to share it with us. Click Send Tips at the top of every page, or tip us on Twitter.